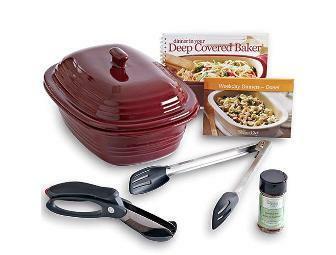 Welcome to the Pampered Chef Dinner Set Giveaway! Books R Us has teamed up with Oh My Gosh Beck!, Finger Click Saver, This Mama Loves, My Vegan Gluten-Free Life and other fabulous blogs to give away this Pampered Chef Deep Covered Baker Dinner Set valued at $155! Make Rush-Hour Chicken Fajitas (or one of 19 other recipes) in under a half-hour! Discover how fun and easy it can be to put a great meal on the table instead of another bag of the same old takeout. Chef’s Tongs, two recipe card collections and Chipotle Rub. I gotta agree with the Chicken Pot pie's. I love em! Chicken pot pie for me, too! Pampered Chef products are fantastic, I got some pots and pans from them almost 10 years ago and they are VERY WELL used and still look and work perfect! I love just about anything in the slowcooker/crockpot. So probably cream of mushroom chicken. I have so many yet I love to cook a roast with vegtables in Pampered Chefs Deep Covered Baker. My ex turned me on to their products and she kept all of them.